Supplied below are handy, up-to-date resources to help inform and educate you about recent changes to tobacco legislation relating to community institutions and events. A range of smoke-free resources designed to help smokers quit and think about their habit. The physical, psychological, social and financial benefits a smoker can experience shortly after quitting smoking. Information and guidance to quitting smoking. Information on smoking cessation for pregnant women and advice on how to quit. Information on using NRT products (patches, gum, lozenges, inhalator and mouth spray) during pregnancy to assist with quitting smoking. Information on range of cancers and other diseases associated with smoking cigarettes and advice on how to quit. Information on health effects of smoking around pregnant women, babies and children; fertility and sexual function and advice on how to quit smoking. Information on how smoking affects your mouth and advise on how to quit smoking. Information on how smoking affects the health of women and advice on how to quit smoking. 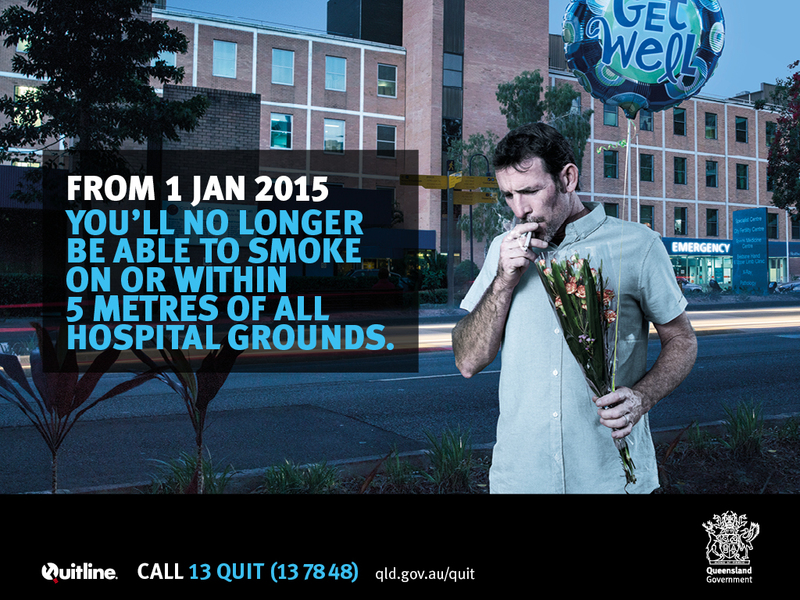 Information on smoking cessation support services available in Queensland. Information on the range of products available to support smoking cessation and advice on how to quit. Information on the range of health complications that smokers may experience during and after surgery, and advice on how to quit. Information about the Quitline (13QUIT) service. Information on the health risks linked to passive smoking. Information on smoking cessation for Aboriginal and Torres Strait Islander people and advice on how to quit. A range of no-smoking signage for general use in public places such as building entrances and other smoke-free areas in the community. A4 or A3 portrait poster. Fact sheets and smoke-free signage for sporting groups relating to tobacco legislation for organised under-18 sorting events from 1 September 2016. Poster to promote new smoking ban at organised under-18 sporting event. Fact sheet for sporting organisation to provide information regarding the new smoking ban at organised under-18 sporting events. Fact sheet for parents and visitors to provide information regarding the new smoking ban at organised under-18 sporting events. Posters, fact sheets and smoke-free signage for sporting organisations about the changes to tobacco legislation from 1 September 2016. Smoke-free area sign for sporting organisations. Posters, fact sheets, and promotional material for public and private healthcare facilities about the changes to tobacco legislation from 1 January 2015. Example of customisable A3 landscape poster. For a customised sign for hospitals and healthcare please email here. A5 or A3 portrait poster or sticker. Small colour card with a summary of the state tobacco legislation for all Queensland public and private hospital and healthcare facilities. A3 colour portrait poster with details of state tobacco legislation for all Queensland public and private hospital and healthcare facilities. Fact sheets and signage for residential aged care facilities about the changes to tobacco legislation from 1 September 2016. Fact sheet for management and staff to provide information regarding the new smoking ban at residential aged care facilities. Fact sheet for patients, families and visitors to provide information regarding the new smoking ban at residential aged care facilities. Smoke-free facility sign for residential aged care facilities. Smoking area sign for residential aged care facilities. Posters, fact sheets, and promotional material for Queensland state and non-state schools about the changes to tobacco legislation from 1 January 2015. Resource that can be an A5 poster, A3 poster, or sticker. Small colour card with a summary of the state tobacco legislation for all Queensland state and non-state schools. A3 colour portrait poster with details of state tobacco legislation for all Queensland state and non-state schools. State tobacco legislation information sheet for all Queensland state and non-state schools. Handout for schools about the state tobacco legislation. Posters, fact sheets, and promotional material for Queensland early childhood education and care services about the changes to tobacco legislation from 1 September 2016. Fact sheet about smoke-free early childhood education and care facilities. Postcard regarding changes to tobacco laws from 1 September 2016. No-smoking poster for use by early childhood education and care facilities. No-smoking sign for use by early childhood education and care facilities. For retailers who sell tobacco products and food/drink businesses with outdoor smoking areas. Form to be completed by licensed venues who wish to have a designated outdoor smoking area (DOSA). An example of how to complete the Smoking management plan. Explanation and definitions for retailers about the laws for selling smoking products in Queensland. What you need to know about selling smoking products over-the-counter or from tobacco vending machines under Queensland’s tobacco laws. Retailer information about the changes to the tobacco laws from 1 January 2015, regarding the sale of electronic cigarettes in Queensland.